[+3] - parados - 01/28/2015I suppose you also believe rtnews that there are no Russian troops in Ukraine and none on the border. It appears you trust Russia more than you trust the west. [+3] - parados - 01/29/2015Leave it to you to worship a foreign dictator who plays with the rules to keep himself in power. I wonder if you think Obama was strong if he stayed in power. [+3] - bobsal u1553115 - 01/29/2015Which one is Barrack Obama? You're backing the wrong jackbooted thugs here. Putin is the fascist imperialist here. [+3] - bobsal u1553115 - 01/31/2015Gunga tried the truth, once. It made him very sad. Basic reality is that th epeople our rogue government is supporting in Ukraine are a bunch of Nazis who overthrew an elected government using gangland tactics. The part of the Ukraine still ruled by Kiev are in a fubar state of affairs and the Obunga admin is planning to send US troops to "train" the Kiev brownshirts in the coming Spring. That's doubling down on insanity and the most likely result of it will be a major war with Russia which would be more likely than not to become an atom-bomb war. This is a major political problem; if you haven't already called you congressional representatives and screamed at them over this, you need to. So, do you think that Russia Today is better than Fox News? The only difference is that Russia Today is state funded. In both cases it means propaganda.. In the case of the situation in the Ukraine, all of the drums I listen to are saying the same thing, left, right center, doesn't seem to make any difference. I'm hearing sources that differ.. I suppose you also believe rtnews that there are no Russian troops in Ukraine and none on the border. It appears you trust Russia more than you trust the west. "Vladimir Putin's Ukraine incursion..." ?? Did you REALLY expect Vladimir Putin to sit there and watch George Soros, Monsanto, and Victoria Nuland just walk off with the Ukraine?? In order to believe that Vladimir Putin is anything other than the heroic figure he appears to be, you need to believe that Bork Obunga, the Rothschilde family, George Soros, Victoria Nuland, John (the gigolo) Kerry, Hillary KKKlintler, and every other one of the "neocon(TM)" fools in our state department are all good people, which is ridiculous. The United States is still demographically a Christian nation but you'd never know it from observing our government. All you ever read about our government doing these days is supporting regimes which persecute Christians and Christianity, and then you ask whose side you think God might be on? You think God could ever be on the side of George Soros, Monsanto, and the Obunga state department?? For that matter do you think God would be on the side of "conservatives" who weren't bright enough to see through demoKKKrat/NWO/Soros/US_StateDept propaganda and BS?? All of that is aside from the fact that Putin almost singlehandedly stopped the idiot greentards and Malthusians from shutting down all of the world's economies in 04 with the Russian hacker attack on the East Anglia CU email database which gave rise to "Climategate" (www.climategate.com). Other than for that, all of the idiots comparing Putin with Hitler would likely be rubbing sticks together to make fire. The rulers of Russia have taken a hard look at the ongoing suicide of the West and determined that Russia is not going to participate. This may in fact be the biggest factor in the tidal wave of propaganda and disinformation which the West is subjected to regarding Russia and Vladimir Putin, and in the policies of our state department. The bankers who run the West hope to prevent the calamity which they are facing by bail-ins and austerity programs and that, combined with the Malthusian and greentard policies of our governments figure to produce a world of major grief for the West over the coming decades. Those people can ill afford the alternative example of a prosperous and happy version of reality in the BRIC nations for everybody on the planet to see on television and the internet. Leave it to you to worship a foreign dictator who plays with the rules to keep himself in power. I wonder if you think Obama was strong if he stayed in power. Which one is Barrack Obama? You're backing the wrong jackbooted thugs here. Putin is the fascist imperialist here. Vladimir Putin inherited a catastrophic situation in 2002 and has very nearly led Russia out of the woods in that time. He almost single-handedly shut down the Kyoto treaty in 04 but for which we'd be rubbing sticks together to make fire and he has played a major role in the formation of the new BRICS alliance which has taken half the world's human population out of the clutches of the world bank, the IMF, the Rothschilds and the Wall St./London banking cartel generally. He is the best ruler Russia has ever had since Tsar Peter; Bork Obunga is the worst ruler any advanced state has ever had since Nero. So you would prefer to live under a dictator. Glad we figured that out. 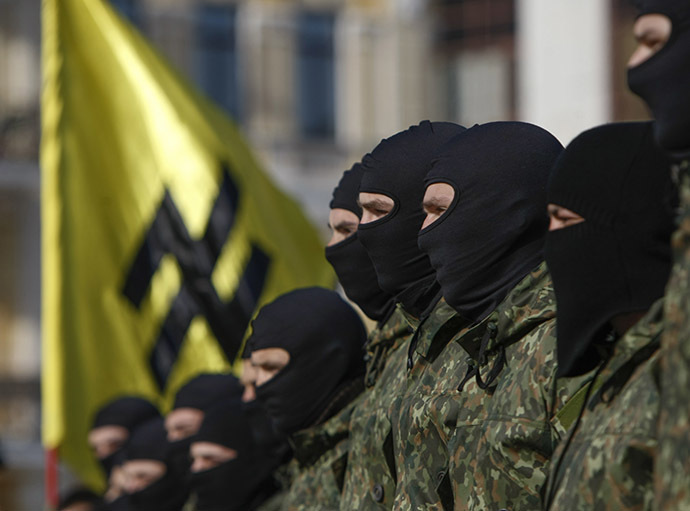 the Obunga admin is planning to send US troops to "train" the Kiev brownshirts in the coming Spring. That's doubling down on insanity and the most likely result of it will be a major war with Russia which would be more likely than not to become an atom-bomb war. If the US can tie Russia down in endless war in Ukraine though, then Russia won't have the energy to invade the Baltic NATO states. A bit of covert aid to Ukrainian militants could result in much greater security farther north. A judge at the UN Yugoslav tribunal has upheld the convictions of five men for their role in the Srebrenica massacre. Sentences for four of the men, high-ranking officials in the Bosnian Serb Army in 1995, were also confirmed. They had appealed against their convictions in 2010 for a range of crimes including genocide. About 8,000 Bosnian men and boys were killed in Srebrenica in just three days in 1995 - the worst atrocity on European soil since the Holocaust. Two of the men - Vujadin Popovic and Ljubisa Beara - are among just a few to have been found guilty of genocide. They were sentenced to life for deliberately targeting and destroying groups of people based on their ethnicity. Those life sentences were confirmed on Friday, as were the sentences of 35 years for Drago Nikolic, and 13 years for Vinko Pandurevic. The sentence of the fifth man, Radivoge Miletic, was reduced from 19 to 18 years. I prefer the legitimate judgement of the international court to a load of shabby propaganda. Gunga tried the truth, once. It made him very sad.